THIS IS AN AMAZING 3 OWNER PCA MEMBER OWNED VEHICLE. 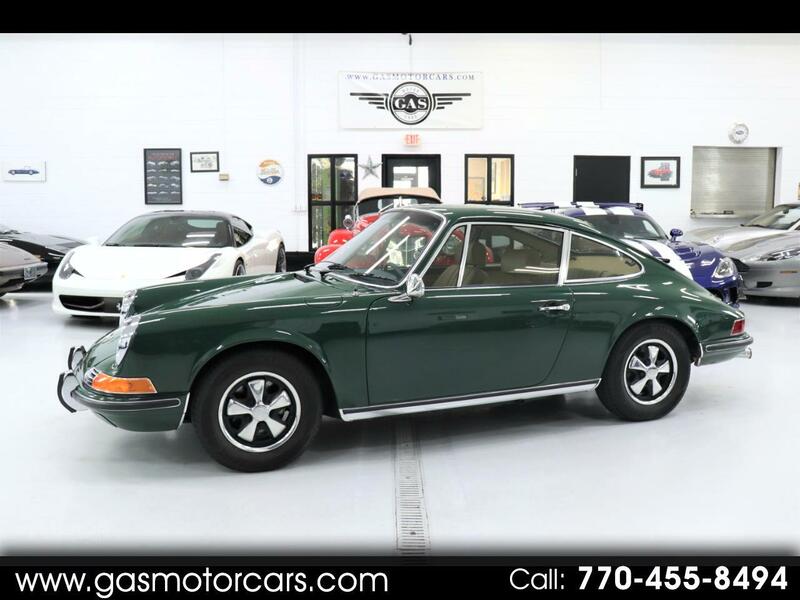 VERY RARE AND DESIRABLE CORRECT FACTORY IRISH GREEN OVER BEIGE LEATHER INTERIOR. ORIGINAL NUMBERS MATCHING 2.2 LITER FLAT 6 WITH 125HP. CORRECT DOG LEG SPEED 901 TRANSMISSION, CORRECT BLAUPUNKT RADIO. DOCUMENTED MILEAGE GOING BACK TO THE ORIGINAL OWNER, SERVICE RECORDS, TOOKS, BOOKS AND MANUALS, ETC. FULLY RESTORED ABOUT 10 YEARS AGO. THIS IS A GREAT AIR COOLED CLASSIC 911 TO OWN, SHOW, OR DRIVE. IT HAS ALREADY WON NUMEROUS PCA CONCOURS. IT WAS PREVIOUSLY REPRESENTED BY SLOAN CARS AND TRISSL. TWO VERY REPUTABLE CLASSIC PORSCHE SALES/SERVICE AND RESTORATION FACILITIES. GAS MOTORCARS INC IS A FAMILY OWNED AND OPERATED DEALERSHIP LOCATED IN MARIETTA, GA. WE ONLY SELL VEHICLES OF THE HIGHEST QUALITY. WE CAN ASSIST IN CLASSIC CAR FINANCING FOR QUALIFIED BUYERS. WE CAN SHIP ANYWHERE IN THE WORLD AT THE BUYERS EXPENSE. WE SHOW VEHICLES BY APPOINTMENT ONLY. Message: Thought you might be interested in this 1971 Porsche 911T.